The Willie Boy Story. Carlota, the daughter of William Mike, a Twentynine Palms Chemehuevi who had moved his family to the Gilman Ranch in the Coachella Valley near Banning, figured in a tragedy that rocked southern California in 1909, and has since been the subject of books and a movie. A cousin named Willie Boy, who had fallen in love with her, persuaded her to elope with him, their marriage having been forbidden because they were cousins. Her father tracked them and brought them back. Accounts vary with respect to what followed, but agree that Willie Boy shot and killed William Mike, perhaps by accident, escaped with Carlota into the desert, was tracked by a posse, and left Carlota hidden in a wash with his coat and waterskin. She died, either shot by the posse by mistake, or from exposure. 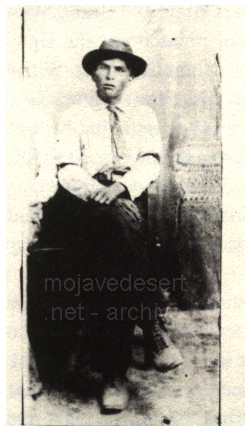 According to Chemehuevi tradition, Willie Boy escaped, but has not been seen again (Trafzer et al. 1997:86-90). The story of Willie Boy was the basis for Harry Lawton's novel, Willie Boy: A Desert Man Hunt, and a subsequent movie, Tell Them Willie Boy Was Here, starring Robert Redford, Katherine Ross, and Robert Blake. A number of Morongo Indian Reservation members played roles in the movie. More recently, historians James Sandos and Larry Burgess published The Hunt for Willie Boy: Indian Hating and Popular Culture, which incorporated valuable data contributed by Chemehuevis who were familiar with the events. Trafzer et al. have included the story as told by Chemehuevi Mary Lou Brown (1997:90-92). An overly dramatic account of the tale by T.C. Weir appearing in Desert Magazine in 1980.